I am the author of The Holy Bible & Mormonism. Sorry, I will not be uploading any pages from my book. Doing so would violate the agreement that I have with my publisher. A growing number of people are critical of Mormons’ religious beliefs and practices. 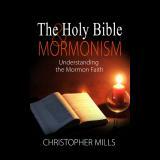 They criticize the Mormon faith by using the Bible as a tool to separate the Mormons from other Christian sects. In his first book, Christopher Mills walks us through quotes from the Holy Bible in order to demonstrate how Mormonism is a true Christian faith and how the Holy Bible upholds their beliefs and practices.